A drone came close to the path of a passenger plane after illegally flying above clouds, an investigation found. The pilot of a Bombardier DHC-8 spotted a "red drone with two propellers" while 5nm (9.26km) east of Southend. The drone came within 50m (164ft) of the airliner on 26 December while flying higher than "cloud tops". An Airprox Board investigation found safety had been "much reduced" during the incident and the pilot rated the risk of collision as high. The incident was reported to Essex Police, who have been asked to comment. It was not disclosed whether any passengers were on the flight, which was heading to London City Airport. A second sighting of a suspected drone in the Southend area was made on 30 December, investigators said. In this incident, the pilot of an Airbus A319 passenger plane saw a "twinkling" red light and a "flashing" blue light about 1nm (1.85km) away. The Airprox Board, which investigates near misses, said safety had been "reduced" in this incident but the risk of collision was low. In both incidents the drones were above the 400ft (122m) maximum limit for unmanned aerial vehicles. 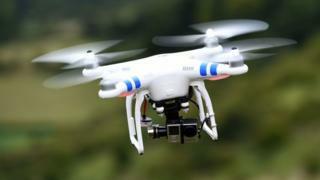 London Southend Airport has carried out trials to track drone users in the area near the airport. In December, London Gatwick, the UK's second biggest airport, suffered major disruption caused by reported drone sightings, with flights grounded and passengers disrupted.